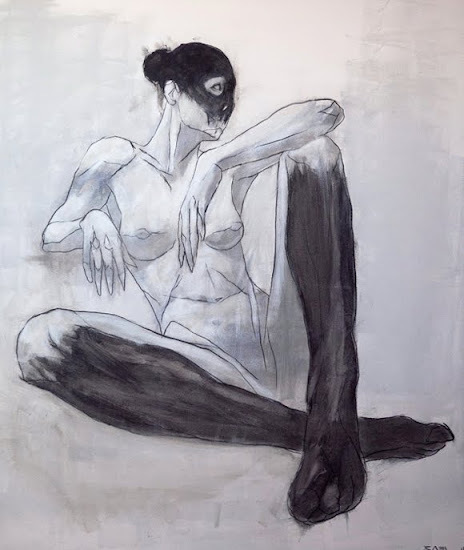 Over the past few years the artist known as 'Bael' has found a definite place on the London art scene, by producing a stunning series of stark, haunting figurative paintings. Using himself as the model in these earlier works, gave them a uniquely atavistic intensity. His very well received first solo show in 2011 at Signal Gallery 'Die Tiere' (The Beast) saw the culmination of this exuberant narcissistic phase. In his new show, 'Rokoko', Bael has found an inverted inspiration in the excessively ornate world of the Rococo. Sticking to his austere guns, the artist has reinterpreted some of the mythological scenes and characters in his own inimitable style. In the artists own words, the arts of the Rococo period fetishized Greek Myths. The ancient stories were transformed into a form of visual confectionery for the gilded palaces of the Royal Court in 18th century Europe. I have taken these same myths and re-imagined them in my own style, dispensing with polite beauty they were once given, instead casting them in a raw and much darker vein. Using a range of male and female models in the new work has helped bring out a wider range of responses from the artist and the new work explores ideas about sexuality, decadence and mortality.